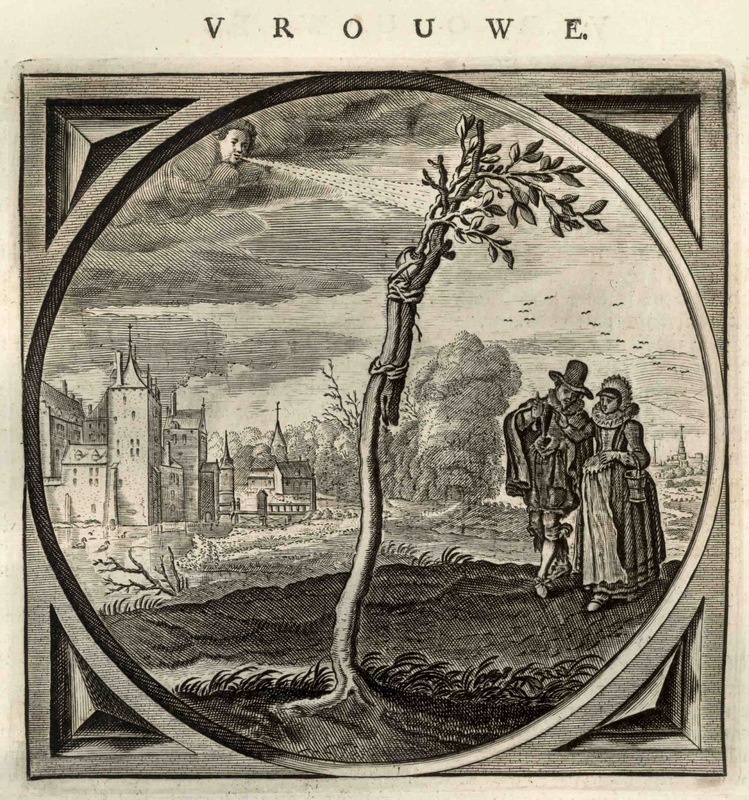 For this final discussion about artists’ use of trees to communicate ideas I wish to focus on the curiously enigmatic meanings of trees often featured in early emblem prints, such as Otto van Veen’s (c.1556–1629) Bene qui latuit bene vixit (shown below). 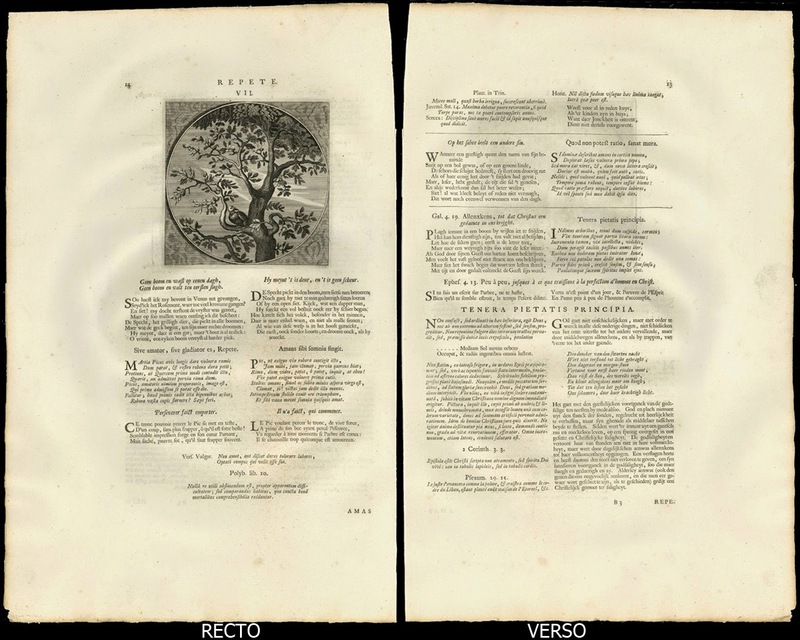 Rather than attempting to interpret a specific meaning for the artists’ use of trees in these prints, all the signifying elements need to be read in relation to one another along with meanings that may be projected by the title. https://archive.org/stream/mysteryoffrancis00smed/mysteryoffrancis00smed_djvu.txt [viewed 15 April 2014]). When the meaning of this text is understood in this context, van Veen’s use of trees and other featured symbols can be synthesised into a full visual metaphor that explains the important moral lesson—in my words: if you live your life without attracting attention to yourself you will experience a good life and your efforts will be recognised. 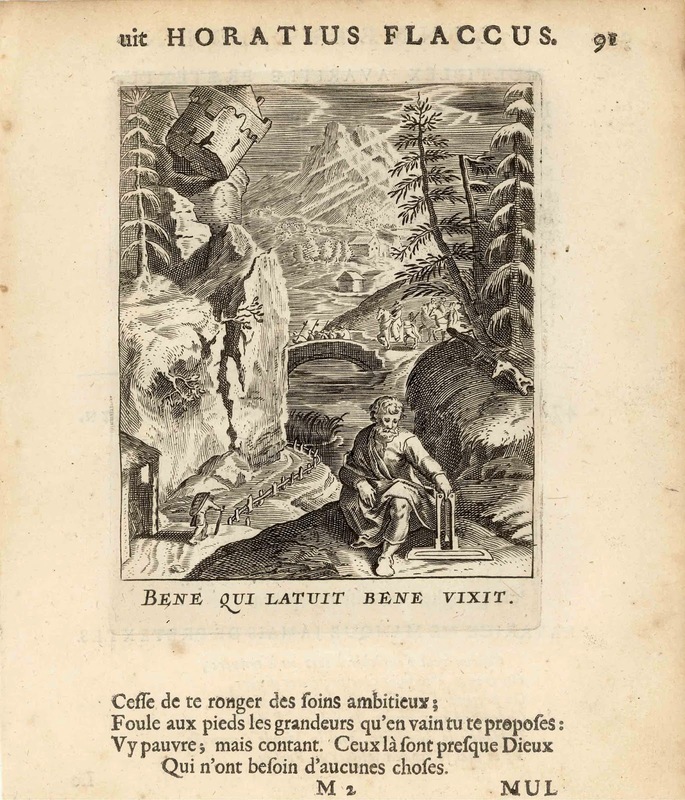 In terms of the portrayed trees on the upper-right of the image, I perceive that the meaning of the text is captured metaphorically by the broken tree concealed within the grove that the broken tree lives on even though a part of it is dead: the moral themes of vanitas and memento mori reminding the view of the inevitability of death (see http://en.wikipedia.org/wiki/Vanitas and http://en.wikipedia.org/wiki/Memento_mori [viewed 15 April 2014]). 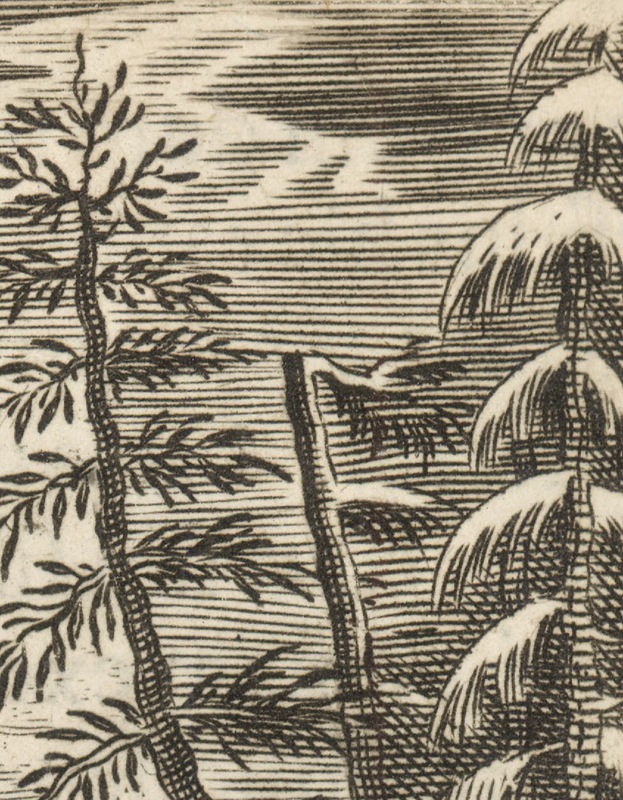 Essentially, van Veen’s use of trees should not be viewed out of context with the other portrayed features in the print or the meaning will be lost and the depicted trees will be nothing more than trees in a scene. [Emblems of Horatius Flaccus], pp. 91–2. 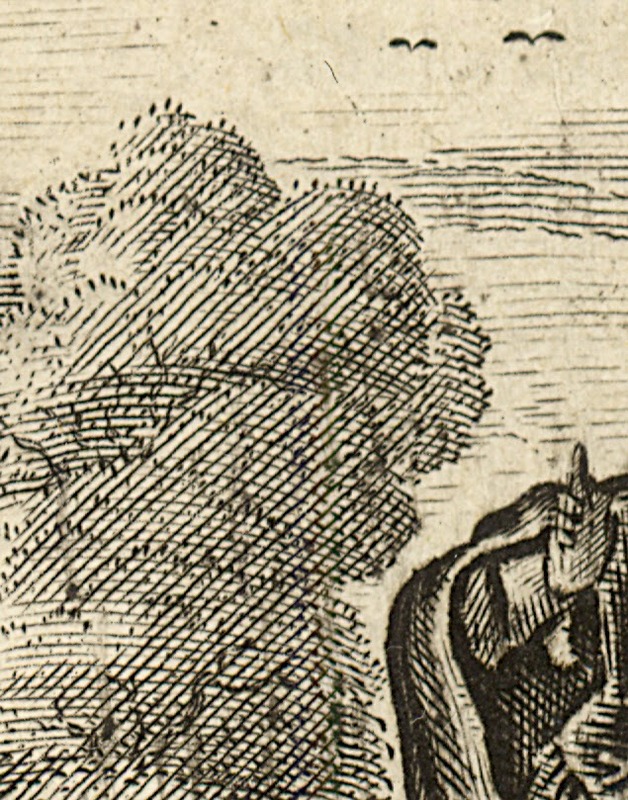 Condition: Strong and well-inked impression on whole leaf printed on both sides with minor signs of use and toning appropriate to the age of the print (1683). In 1419, a monk discovered a manuscript from the fifth century known as the "Hieroglyphica" of Horus Apollo or Horapollo on the Greek island of Andros. It was alleged to be a Greek translation of an Egyptian work which explained the hidden meaning of Egyptian hieroglyphs. It stirred up great interest among the learned when it arrived in Florence in 1422. 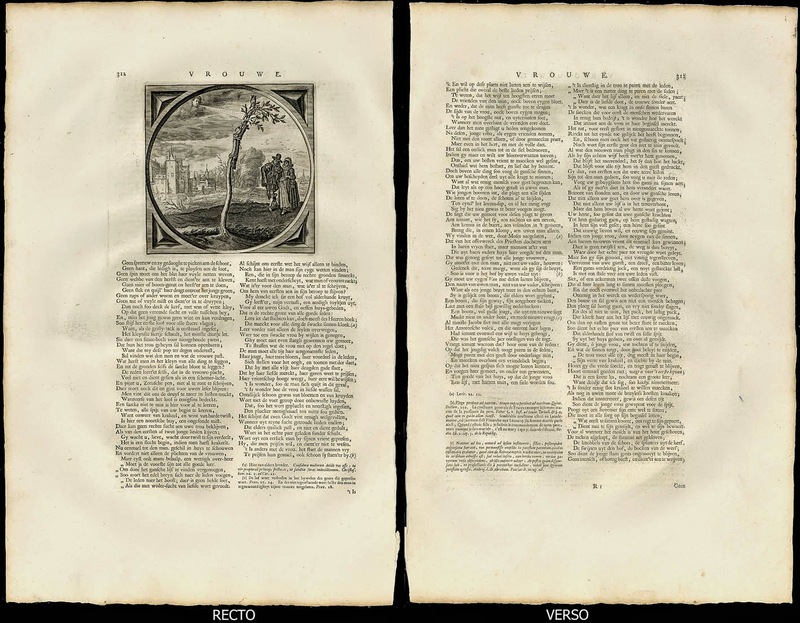 Although much of the information in this work was later proved false, it none the less had a great impact on Renaissance thought and in fact was one of the inspirations for the Emblem books. In short, the concept of emblematic images with its roots in ancient Egyptian prototypes perceived to underpin the text, Hieroglyphica, gave artists an approach to crystallise complex and multilayered ideas into a visual language of a single motif or related motifs that informed viewers could read (i.e. those who had a lexicon of explanations for the motifs used). Two Figures Asleep in Moonlight with Swarming Bees (Bartsch 0608.426; p. 363). Like all good illustrations designed to communicate an idea, emblem prints capture, in the sense of “freeze framing,” a pivotal point in a narrative or line of thought. 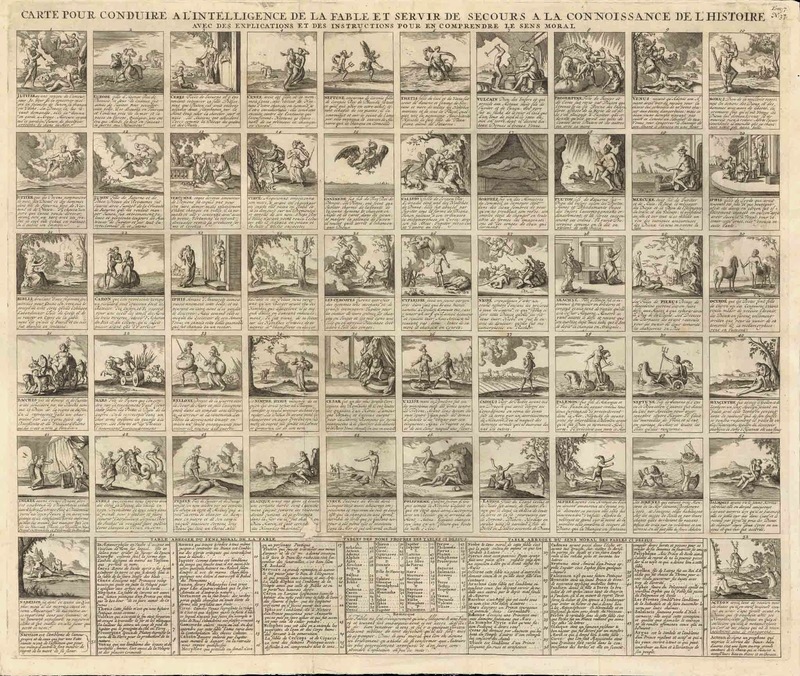 Sometimes the choice of this pivotal point may be so important that it even becomes an element in a game, as is the case with the large composite print by Henri Abraham Chatelain (1684–1743), Carte Pour a l’ Intelligence De La Fable et Servir De Secours a la Connoissance de l’ Histoire (shown below). 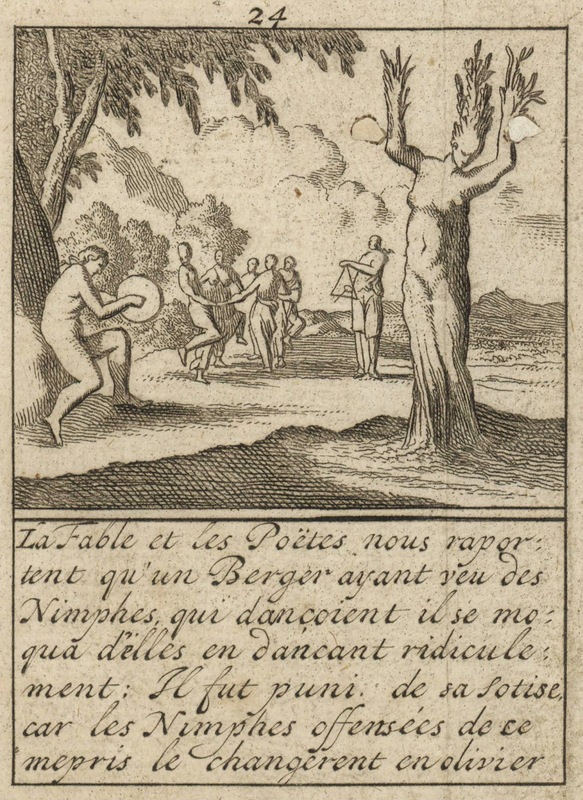 In this print, the pivotal point in Ovid’s allegories are pictorially captured in image cells used as memory aids for recalling the myths in the context of a test; a type of print known as a “catchpenny-print.” For example, the myth of Apollo and Daphne is crystallised at the moment of Daphne’s metamorphosis into a tree to escape the ardent pursuit of love-struck Apollo (see detail further below and for an account of the myth: http://en.wikipedia.org/wiki/Apollo_and_Daphne [viewed 23 April 2014]). 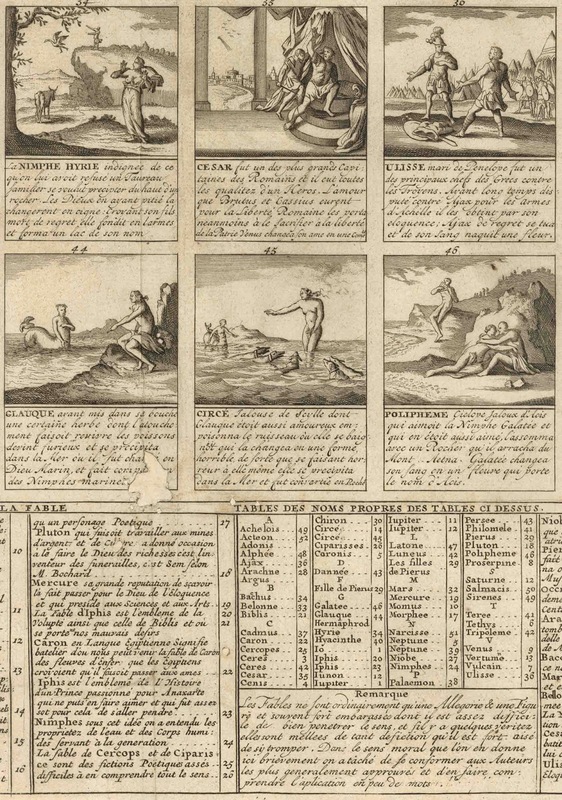 http://ovid.lib.virginia.edu/mythcards.html and view details of each of the emblems by either clicking the directional figures or the page tabs: http://ovid.lib.virginia.edu/cpc/0001.html [viewed 16 April 2014]). Condition: Excellent impression of this rare and large print with its margins as published. The sheet is in fair condition with backed-up holes and losses (i.e. imperfections have been restored). I am selling this engraving for a total cost (including shipping to anywhere in the world) of $142 AUD. As the print is a large size it will be rolled in a tube for shipping. Please contact me using the email link at the top of the page if you have any questions or click the “Buy Now” button below. This principle of choosing a pivotal point in a narrative or line of thought is all about synthesising critical information in a timeless moment rather than a split-second temporal moment. Or, to express this from a different perspective, like all the principles underpinning emblem prints, the key aim is to present essential visual information in a formal way wherein notions of time are inconsequential and the calculated juxtaposition of symbols and motifs alone project meaning. For instance, in the image shown above of poor Daphne turning into a tree, the essential visual information is the depiction of Daphne as part lady and part tree. Moreover, the way that Chatelain portrays her presence, Daphne is in a timeless state: pictorially frozen in an everlasting state of being morphed. Chatelain also contextualises Daphne’s everlasting moment as a happy state for her in that the figures surrounding her are engaged in music making and dance. 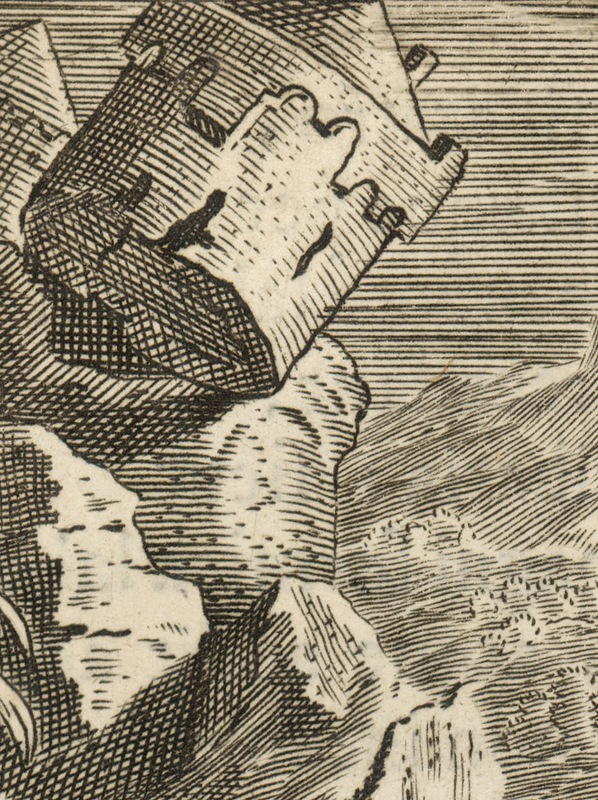 A fine illustration of the principle, visual dialogue—a principle discussed in the earlier post, 3 Key Principles: Goltzius & Piranesi (http://www.printsandprinciples.com/2012/05/goltzius-piranesi-3-key-principles.html)—can be seen in van der Venne’s engraving, Vrouwe (shown below), printed in a leaf from Cat’s Alle de Wercken van den heere Jacob Cats … . 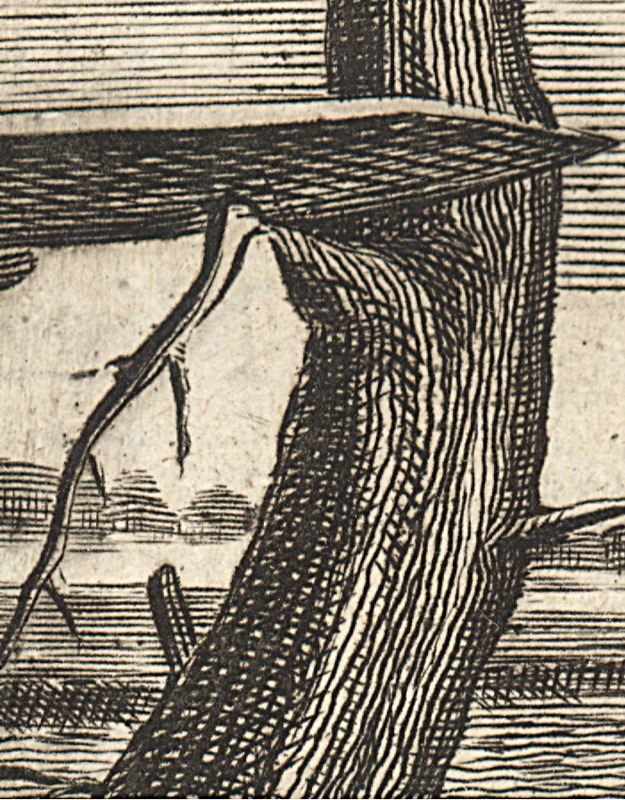 The visual dialogue here is between a tree trunk with a grafted section of another tree and a married couple approaching the grafted tree. 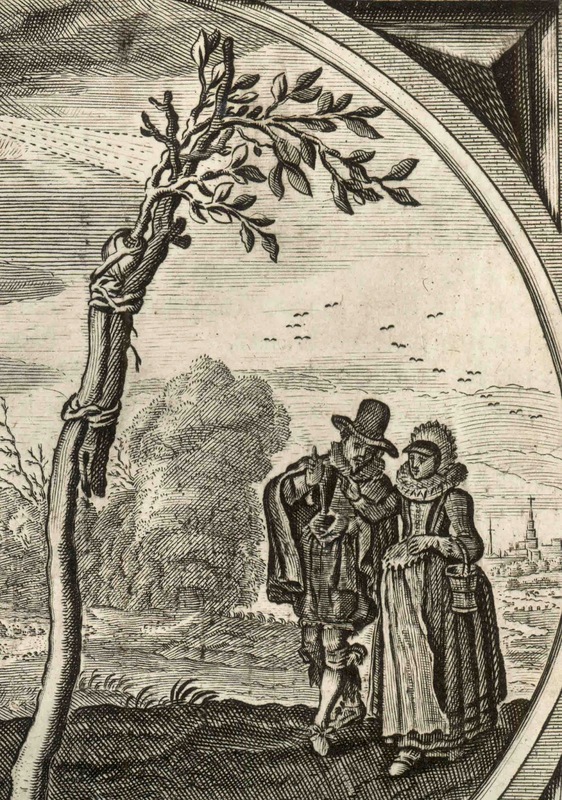 Vrouwe [Lady] An emblem print comparing a married couple to a grafted tree. 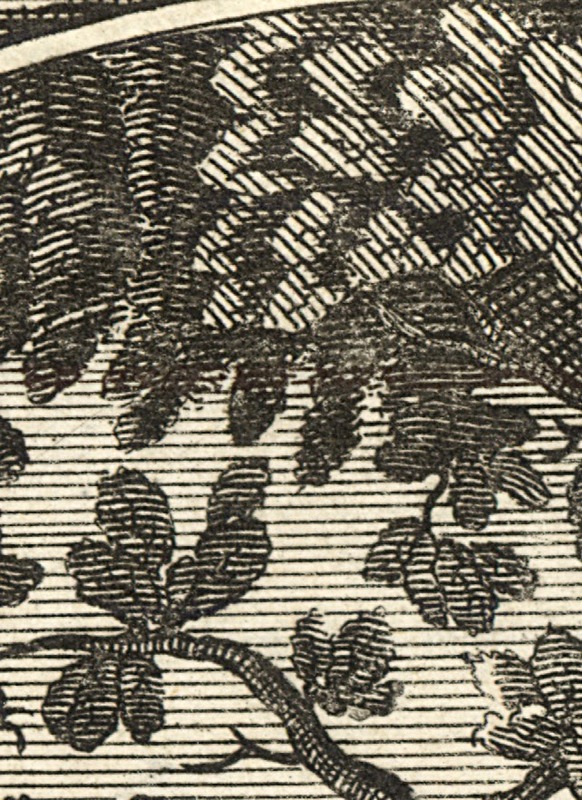 This engraved leaf is from the 1659 edition. 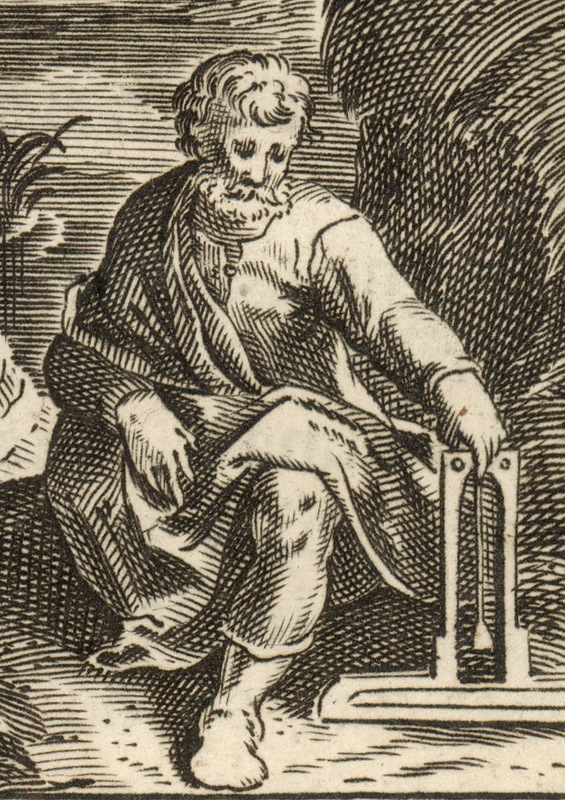 Engraving on full sheet of laid paper (2.8 cm chainlines) printed on both sides as published. Condition: Superb impression of this early print with its margins as published in near pristine condition. The sheet has wrinkling from the printing process and there is faint age toning at the extreme edges. 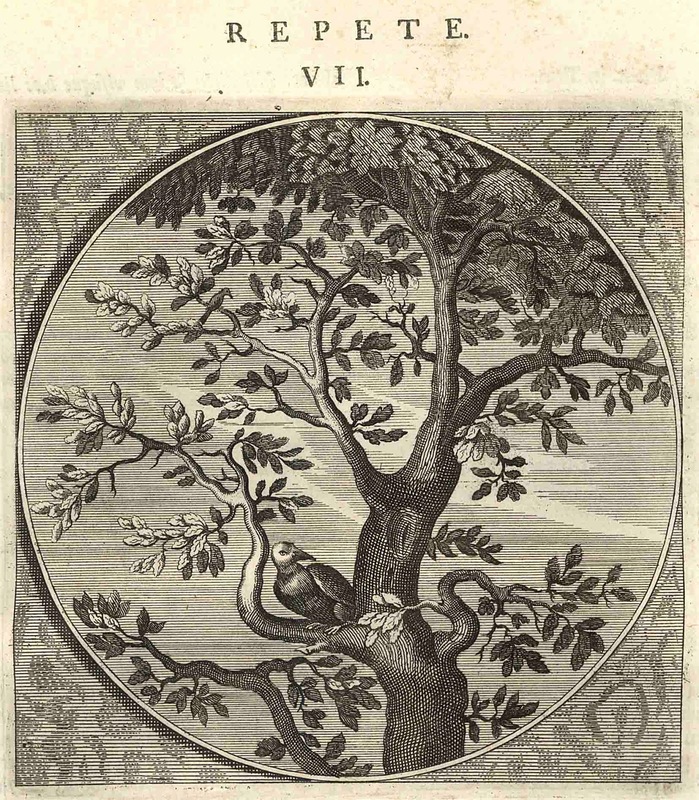 Going further with additional readings, I see the “old stem” as the masculine element in the grafted trees and that it supports the well-foliaged “branch” which is the female element in the union. My perception of gender roles is not arbitrary. Instead it is the result of seeing the man on the left side of the lady and finding visual correspondence with the “old stem” on the left side of the “branch.” This reading also has cultural resonance as the arrangement matches the Western tradition of showing men on the left of women, such as shown in Albrecht Dürer’s Adam and Eve (see http://commons.wikimedia.org/wiki/File:Adam_Eva,_Durer,_1504.jpg) and Jan van Eyck’s Portrait of Giovanni Arnolfini and his Wife (see http://en.wikipedia.org/wiki/File:Van_Eyck_-_Arnolfini_Portrait.jpg). To illustrate the principle of spatial flattening (i.e. 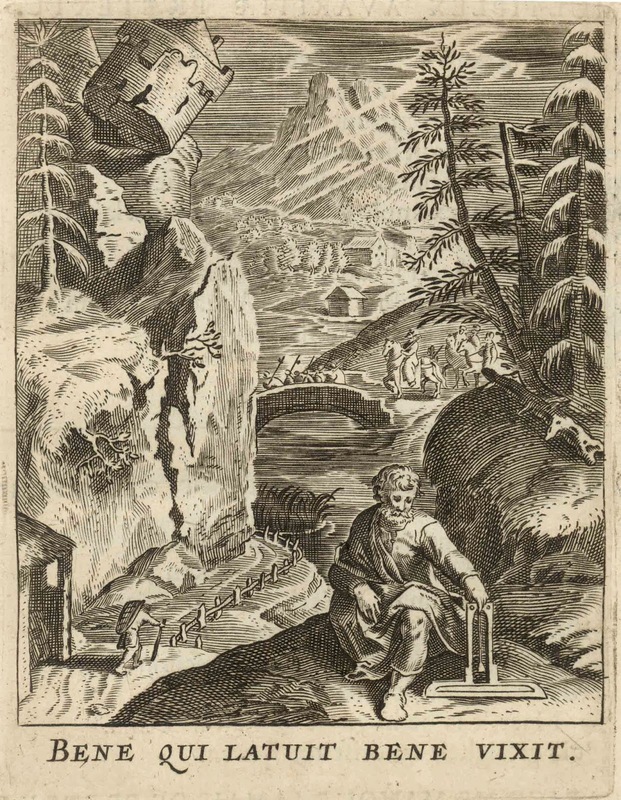 pictorially squashing the illusion of space in an image so that there is little depth), the engraving, Repete (shown below), displays Adriaen van der Venne’s treatment very well. Certainly the illusion of shallow space is helped by the simplicity of his compositional arrangement: a woodpecker perched in a tree with a view of open sky beyond. On close inspection of his way of rendering the foliage as shown in the detail further below, van der Venne employs a play of deep shadows and highlights to present the leaves as if they were in the shallow space of a bas relief. Note also that the tree limbs share in this compression in the sense that none of the limbs advance or recede in a fully three-dimensional way. Gheen boom en valt ten eersten slagh. 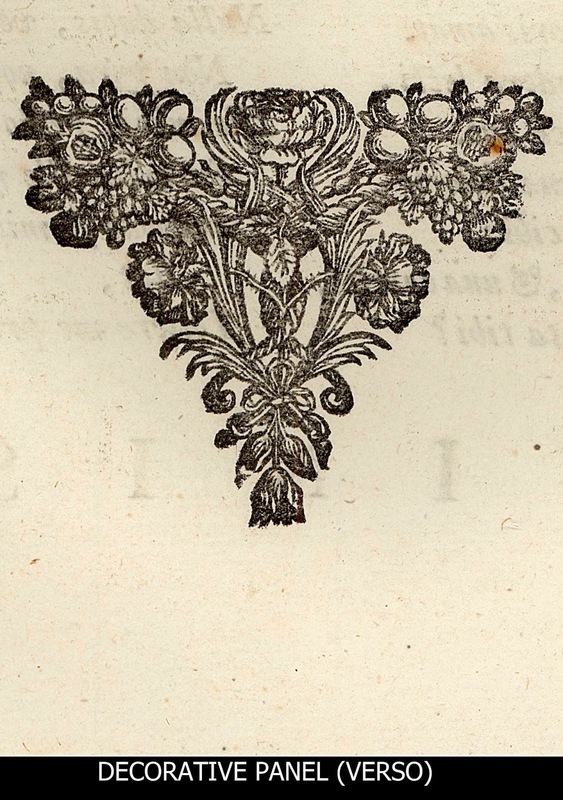 This engraved leaf is from the 1659 edition. Note that in some editions the plate has been is cut in reverse (i.e. the image is mirrored). Seyd’ ick het Rosemont. Waer toe veel kromme gangen? O vrient, een eyken boom vereyst al harder pick. Did grapple with my love forthwith: what need I then to lye. The Spitt pickt at the Oaken tree, but saw it no whit mooved. The principle of flattening the illusion of space is linked closely to the third principle that I wish to discuss: foregrounding of imagery. I mention this in the sense that by compressing the key features of an emblem print within the shallow confines of the foreground, a viewer’s attention is focused on the relationships between the critical features. 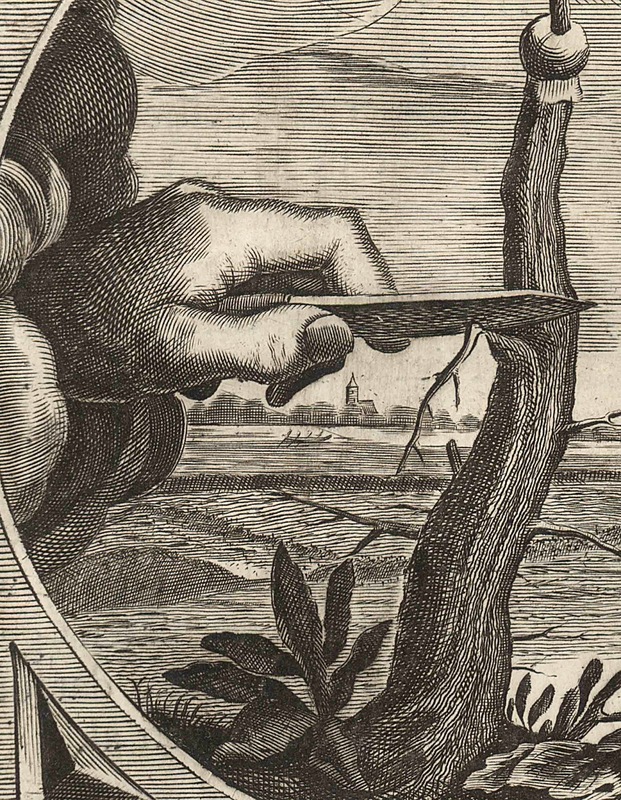 In the engraving, Sufficit Una (shown below), for example, a viewer would have difficulty in ignoring the activity on the left-side of the image involving a cloud-borne hand slicing into a tree with a grafting knife. 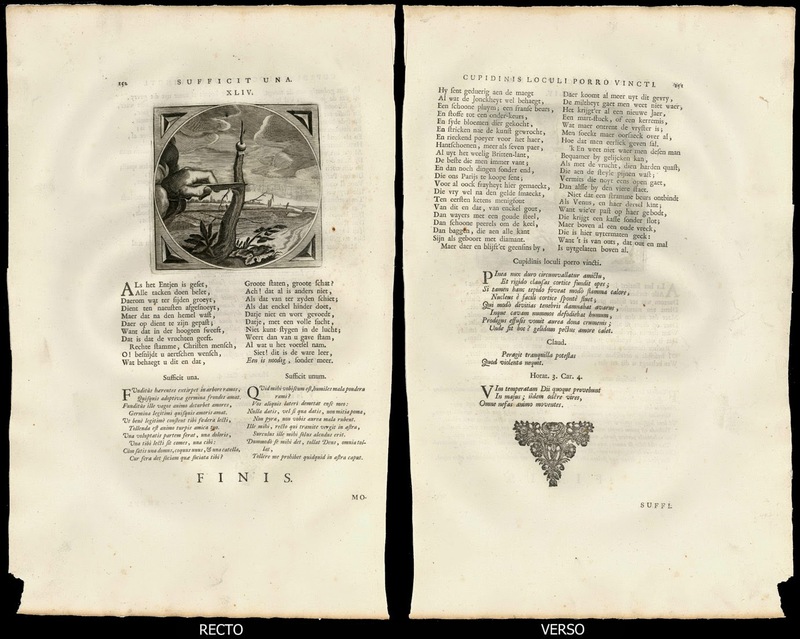 After this visually arresting initial reading, however, a viewer is then able to freely contemplate the distant landscape features on the right side of the image. This arrangement of foregrounding the key features gives emblem prints visual impact for their didactic role; namely, a web of symbols designed to communicate moral truths, virtues and wisdom. Sufficit Una [One Suffices]. 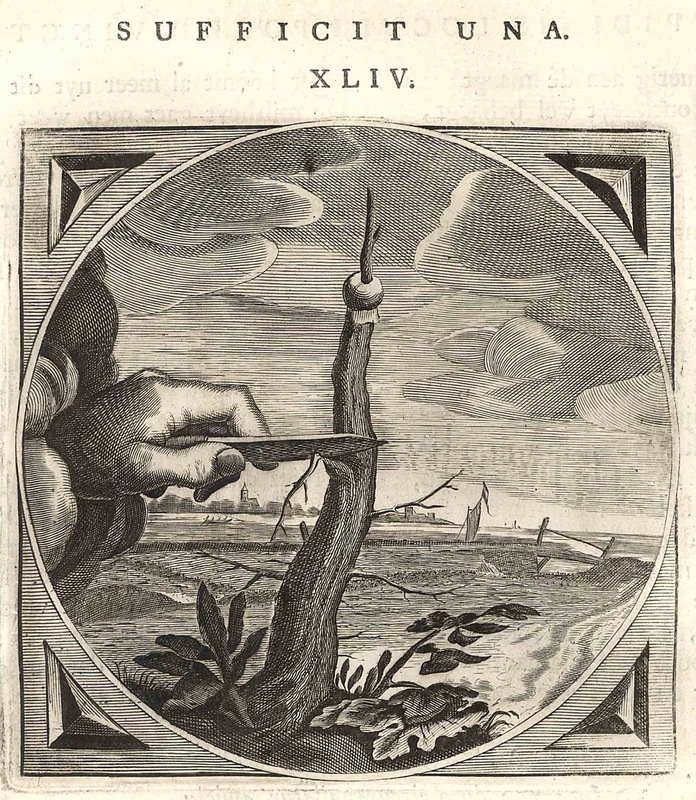 This emblem print references proverbs such as “Enough is as good as a feast”. 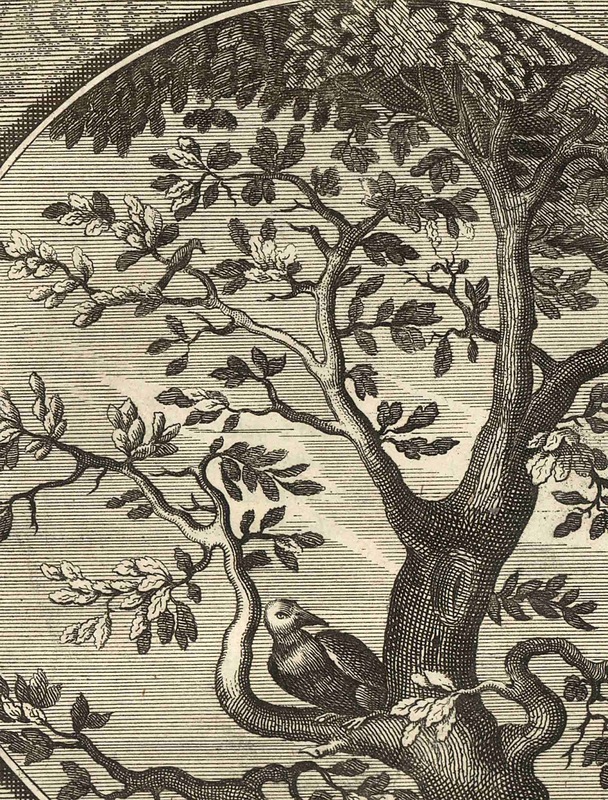 From Emblemata Moralia et Oeconomica [Moral and Domestic Emblems], 1627, in Alle de Wercken van den heere Jacob Cats … [Complete Works of Jacob Cats], 1655, p. 152 (https://archive.org/details/alledewerckensoo00cats [viewed 23 April 2014]). Condition: Superb impression of this early print with its margins as published in near pristine condition. The sheet has wrinkling from the printing process and there is faint age toning at the extreme edges. There is also a small dark dot imperfection in the paper to the left of the image and the left and right edges of the sheet have irregularities: the lower-left corner is missing and the right edge has been trimmed unevenly. 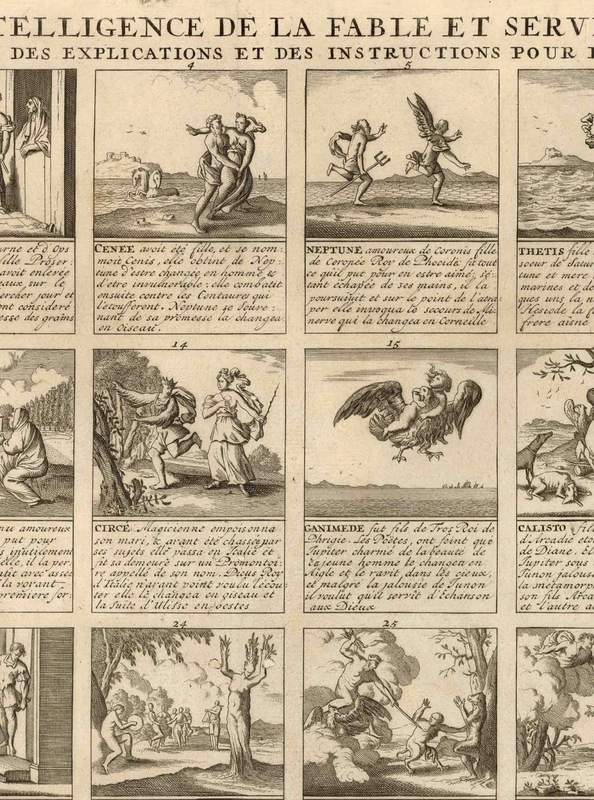 Although many of the early emblem prints and books were designed to appeal to an audience of the privileged few who were able to decipher meanings from esoteric symbols, this was not the case with Jacob Cats. He earned his affectionate title of “Father Cats” because his books were accessible in terms of being decipherable to general readers of the time and because the images in his books were engaging to look at and projected meaningful content that we now call euphemistically: home truths. 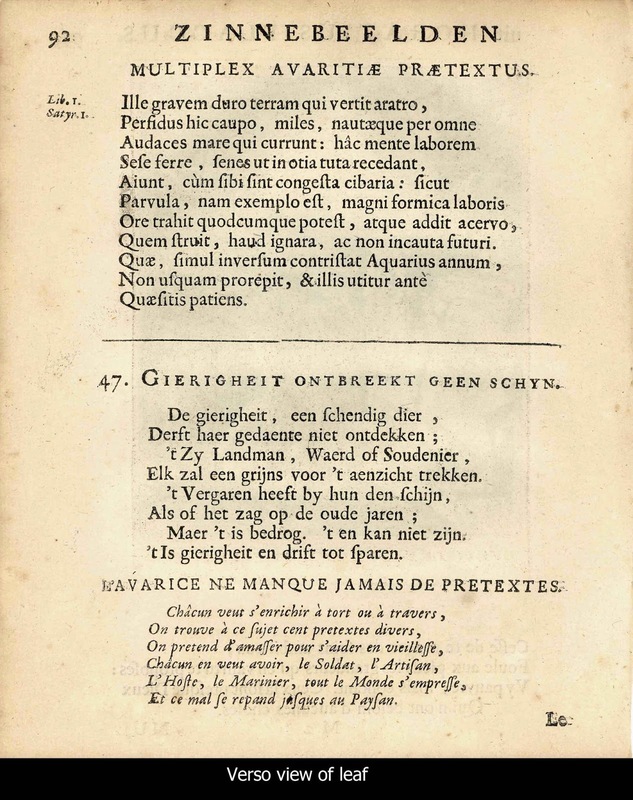 In fact, the impact of Cats’ emblem books was so profound in the Netherlands that Marijke Spies (1999) in Rhetoric, Rhetoricians and Poets: Studies in Renaissance Poetry and Poetics proposes that with regard to Cats “in his endless verses [that] propagated the characteristics, virtues, and duties of the Dutch burgher housewife … No books, apart from the Bible, were so widely read—and listened to when read—as his” (Spies 1999, p. 120). Thanks ... your comment has helped to motivate me. I'm about to start writing right now!